May I say I simply adore this movie? I might even like it more than Spirited Away. Sure the plot may be a bit confusing or weak or not really there, but I love it. 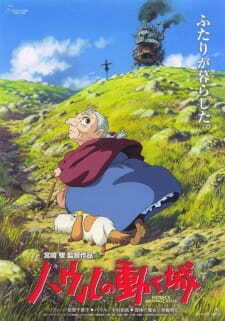 The reason why Howl's Moving Castle is quite likely my favorite Ghibli movie is because of its main premise. I loved how Sophie was turned into an old woman. The feeling of helplessness it instigated in Sophie was nice to watch. It actually may have been this movie that started my love for body swapping, genderbending, turning into an animal, age regressing, and of course rapid aging. Long as something happens to a character's body and it's out of their control, I love it! Random people, feel free to tell me if you know of an anime or manga I don't know of that has one of these great plot devices! Oh, but the story needs to be decent. Oh um, I'm supposed to talk about this movie right now. It's honestly been forever since I've seen it so... I don't know what to talk about. Well, I think I remember telling some people about it... Or maybe I didn't. You know what? I just need to rewatch this sometime. Maybe then I'll actually remember more. Uh... that's all for now. Maybe I'll edit this some time and add more! Yes I am! Technically, that is. I'm going through all the anime I've seen in chronological order. And very early on in my anime career I watched a ton of Ghibli movies. I'll go over Kiki's Delivery Service soon, and I agree, it is really cute!